Do you like reformed Christian books? Do you want to buy more Reformed Christian books? Sites you can count on ad being historically Reformed, or offering links to good Reformed teaching. Sites on ministries that should not exist, but do, and should be under the watch and authority of the local church. Sites that are linked to Independent or Baptist churches and sites, usually demonstrating the doctrines of grace, or links to particular Baptist theology. Sites you might want to visit, but you have to be careful about the theology that is often mixed in. The battle cry at Semper Reformanda is like the cry of the Marines, “Forever Faithfully Reforming”. We will die for the cause if need be. In this age of relativism, complacency and universalism, Semper Reformanda has vowed to rightfully reject all things contrary to the word of God and plant their flag in protest. You’ll find a gigantic amount of great material there for edification and spiritual growth. Are you searching for meaning in life? Bible Sermons Online makes available free sermons to show you that it can be found in Christ Jesus. Have you found the joy of salvation in the Lord Jesus Christ? Bible Sermons Online provides free expository sermons to encourage you in the way. A Reformed missions endeavor to Jews which is backed by the PCA. A reformed conference that desires to restore a proper view of the life of the mind in Christ’s Church. Speakers may include Rev. Dr. Bryan L. Chapell, Robert L. Reymond, Dr. Leland Ryken and David Calhoun. Covenanters, Covenants, and Covenanting…in defense of the Covenanted Reformation. To promoter and defend Bible Protestantism with Dr. Ian Paisley. A page offering some insight into the position of Exclusive Psalmody. Fie and Ice offers one of the largest Puritan databases on the internet. If you have not visited this site, then you are missing some of the best reformed literature available for free. This is a Presbyterian discussion and learning forum for reformed doctrine. Here you will find the Genevan Psalter and its history. They also have links to all the Psalters in order to listen to the music for each of the hymns. The H. Henry Meeter Center for Calvin Studies is a research center specializing in John Calvin and Calvinism that opened in 1981 and is located at Calvin College and Calvin Theological Seminary in Grand Rapids, Michigan. This site section is committed to bringing you the largest body of Edwards’ writings on the Internet. They believe, like Edwards, that the chief end of man is to Glorify God and enjoy Him forever. It is in that spirit, that that their web site is brought to you. Yes, that is right, you can hear real audio sermons from the good Dr. at this site! One of the best Reformed link sites ever built. It houses just about everything you can think of as a portal to good Reformed information online. Monergism also has a great bookstore and lots of Reformed Literature. ►The Orthodox Presbyterian Church – The church’s denominational website. Here is a Spanish web site that, while in continual construction, is totally dedicated to Covenanted Presbyterianism. On this site, which currently is one of a kind, are the complete and original Westminster Standards, yes every single one! They have works by Rutherford, Gillespie, Knox, Calvin, histories, all of the Westminster Standards in Spanish, the Spanish Psalter, and coming soon Watson’s work on the Lord’s Day. All in Spanish. ►Pressie Church – Australian Home of Covenant Theology. This site is a vociferous advocate of Covenant theology as the most faithful framework to understand God’s redemptive purposes in Christ. As a response to indifference and ambivalence towards Reformed theology within the Presbyterian Church of Australia this site hopes to encourage and engage many on this most important issue. Lots of articles here on the topic!! Assembly articles and news for the Presbyterian Layman. The best, and most quickly growing online Reformed discussion group this side of heaven! 3000 members, over 150,000 posts and thousands of Theological and Reformed Topics! Here you will find The Puritan Storm, a publication now in a financial support development stage. Jeff Ziegler, of Christian Evangelistic Endeavors, Reformation Bible Institute, and the Association of Free Reformed Churches of Ohio is the publisher of The Puritan Storm. Do you like listening to sermons – online or off? This is one of the largest audio links preaching – but reader (or listener) beware, there is also a number of very bad sermons out there as well (theologically deviant.) Be discerning. A list of Reformed Links and publications from “around the world.” Therese are many Dutch writings here. SWRB offers Free Christian (Reformed) Books and Audio Free Mail Order Discount Catalogue Upon Request, Geneva Bibles, English Hexaplas, Psalters and Psalms Singing Cassettes and CDs, Lowest Price Anywhere on the Westminster Confession of Faith, Home schooling Helps, Children’s Books, Family Books, Calvinistic Sermons Cassettes, Videos, Tracts and Newsletters, Hard and Softcover Books (from Banner of Truth, Soli Deo Gloria, Presbyterian and Reformed, etc. ), Rare (Presbyterian, Puritan, Covenanter, Reformation) Bound Photocopies, Rare (Classic Calvinism and Protestant) Hardcover Photocopies, Search Engine, and much more! The United Reformed News Service is operated by the Christian Observer, a Southern Presbyterian periodical, established in 1813. The news service carries news from the conservative wing of the Christian Reformed denomination and independent congregations in the Alliance of Reformed Churches, but also carries material on other denominations such as the Presbyterian Church in America, Orthodox Presbyterian Church, Christian Presbyterian Church, Reformed Church in America, Protestant Reformed Churches, Netherlands Reformed Congregations, and the Conservative Congregational Christian Conference. Since its acquisition and name change in May of 1995, this news service will likely shift its focus to include more extensive coverage of denominations outside the Dutch Reformed tradition. Listen to the Wild Boar take a bite out of some bad theological ideas and views. This is Ages Software’s discussion forum and information index for the Reformation Giant John Calvin. Helping Christian American restore their biblical vision about our country founded by Gary Demar. The book “Lectures on Calvinism” can be found here posted on this website in dedication to the Dutch theologian Abraham Kuyper. Here you will find Reformed, Lutheran and Baptist evangelicals writing articles in the Augustinian tradition for ecumenicity. The Alliance of Confessing Evangelicals is a charter member of the Evangelical Council for Financial Accountability. They fully meet their standards for financial management and disclosure each year. Independent outside auditors certify that funds are properly managed, and go to the projects for which they were given. Espouses authentic reformation and revival principles from the Scriptures and is home to the magazine The Chalcedon Report. Main advocate is RJ Rushdoony. If you are now aware of this magazine, then you need to visit this site. I recently purchased the CD ROM they offer with all of their past magazines on it and I was well pleased. It is an offshoot from Christianity Today (which is deplorable overall) but this magazine has some very good historical information. This is the home page of Larry Burkett’s work on Christian finances. The Southern Baptist Convention’s searching site by the Founder Movement. Geneva is their search engine for reformed links. Kerux has been printing biblical-theological material in the Reformed/Calvinistic tradition since 1986. It is published three times per year (May, September, December). Subscriptions are $15.00 for U.S., Canadian and Mexican subscribers and $20.00 to all other countries. This site is working to strengthen and revive evangelical ministries in their preaching, worship, evangelism and service. Watchman Fellowship is an independent Christian research and apologetics ministry focusing on new religious movements, cults, the occult and the New Age. We serve the Christian and secular community as a resource for cult education, counseling, and non-coercive intervention. We accomplish these tasks through our church presentations, our magazine, The Watchman Expositor, personal counseling, this website, and other activities. This site is dedicated to Glorifying our God and Savior Jesus Christ through the true Biblical Gospel that was rediscovered and confirmed during the Protestant Reformation. Preachers such as Brother Jim Gunn, Brother Dean Olive, and Brother Jim Gables can be found here. James R. White has prominence here. You will find this site offering apologetic and theological material, as well as a number of articles by White himself. Chapel Library has a sermon and tract ministry that houses many good things concerning puritan reprints. Johnny Farese’s “reformed” Baptist Church Listing can be found here. John Farese is 44 years old and one of the oldest persons to reach that age after being diagnosed from birth with Spinal Muscular Atrophy. His testimony can be found here as well. He is a member of Emmanuel Baptist Church. This site is where Bethlehem Baptist Church and John Piper’s ministry reside on the web. Search his sermons and a host of other very well done articles. This England bound site upholds the Doctrines of Grace, and the theology of it’s contributors is solely from a reforming perspective. It upholds the God breathed inspiration and inerrancy of the Scriptures, and identifies with the Reformation in seeking to contend for the faith once delivered unto the saints. The hall is one of the best church historical sites with a variety of links to other sites with the same topics and historical eras. This is Phil Johnson’s site who attends Grace Community Church with John MacArthur. A Southern Baptist Website. On this site you can find John Quincy Adam’s book “Baptists, the Only Thorough Reformers” (though the thesis is quite wrong) as well as information on Baptist History. A site dedicated to helping Christians understand the importance of the local church (Baptist view). Mark Dever is the Author and Speaker in the forefront here, who is pastor of Capitol Hill Baptist Church. RGM centers upon the public speaking and writing ministry of its founder and pastoral leader, Dr. Stanford E. Murrell. RGM is a non profit corporation in association with Sovereign Grace Baptist Church. The doctrines of grace are found in abundance here, as well as some good historical writings of the Reformers and Puritans. The Reformed Reader is a website dedicated and committed to the historic Baptist faith. It is the purpose of their website to introduce to those who are new to the Baptist faith their rich cultural heritage of Baptist doctrine, theology and history. To others, The Reformed Reader will hopefully add to the already rich Baptist heritage and will aid all in receiving a more thorough view of the historic Baptist faith. Home of Pastor Albert N. Martin and the Trinity Book Service. This is Phil Johnson’s site which is one of the largest Spurgeon archives on the Internet. By God’s Grace, this site offers over 2,250 Spurgeon single sermons in modern English on the site in pdf format—easily read and/or downloaded. They have over 50 sermons in “booklet” format, including the best TULIP sermons and Defense of Calvinism. Professor Sikkema’s links cover reformed theology, science and Christianity, Christian Academia, churches, and books. This ministry is committed to the reading of books that will change and impact lives. God centered, Christ exalting. The Doctrines of Grace proclaimed by authors such as C. H. Spurgeon, A.W. Pink, John Bunyan and other Puritan writers. Also included are writers of today who fearlessly battle for truth, traveling the “old paths” in the steps of the “giants” of the faith in other times. Smaller writings addressing today’s needs are also available. This is a very helpful site with LOTS of great articles refuting Roman Catholicism, as well as helpful articles on Reformation History, and Miscellaneous articles written by some of Richard Bennett’s friends. Definitely visit! – and send your Catholic friends there too! This site lists a number of ways to search for various kinds of Bibles or MSS (manuscripts) on the internet. Despite the name of the site, it is not a site selling books; all the materials (translations of the Confessions, classic works by Bunyan, Pink, etc., Calvin’s Institutes, many more) are right online in Chinese. Reformed Home Schooling. Welcome to Covenant Home Curriculum, providers of a complete, eclectic, K-12, classical-approach curriculum, built upon the enduring strength of a Reformed Christian world view. This site has a tape lending library for many of Jay Adam’s tapes – as well as the ability to purchase his tapes on cassette. Jay Adams is definitely worth listening to. GraceNet UK is intended to become the Internet home for any UK-based Reformed Evangelical Christian organizations and churches. The purpose of this site is to act as a single point of access to a wide variety of Reformed resources, including a directory of UK churches and organizations. Do you know anything about Oliver Cromwell and the golden Age of Learning? A well-made website featuring a team of actors portraying William Tyndale and the story of the English Bible. They also have some pictures here and historical essays on the transmission on Tyndale’s work. One of the best listing sites for Reformed information and articles. It houses a huge number of archived articles on almost every major theologians and preacher that is significant. There is even some hard to find information on the second generation reformers. Interesting site dedication to the Pilgrims. An Exploration of the Arts, Music, and the Christian Worldview. Lots to read at this site. Some good Links; Lord’s Day observance Society, Trinitarian Bible Society and more. The pilgrim church presently exists with her Head in heaven, a reality belonging to the age to come. But she also sojourns in this world, this age. And while living in this age of sin and death, she shares in the sufferings of Christ, but is also waiting for the blessed hope of her Head’s appearing. This Website exists to promote historic Reformed doctrines through the writings of pilgrims throughout the ages. Articles concerning creation, the resurrection, the existence of God, the atonement, predestination, roman Catholicism and more. 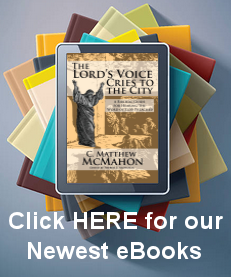 Reformed sermons, literature and Real Audio debates can be found here. This is the website of Cross Daily where you can find all sorts of links (both good and bad). Be discerning! CRTA used to be an excellent website loaded with articles on theology, history, and apologetics (Presuppositional). They still have some documents that are great, but they also have some articles written by men of the Federal Vision persuasion – be aware! Lots of good online Bible study material, even the 1599 Geneva Notes – however, also lots of junk – Be discerning! Historical Reproductions, offers Original and Reproduced Prints, Exquisitely Framed Original Bible Leaves and Christian Art that has been uncovered and preserved. Warning: This site also contains “images of Christ” forbidden in the second commandment. Please be wise in what you browse and buy. The mission of Soli Deo Gloria is to provide “instruction in righteousness” to the Church through the reprinting of classic Christian literature. It is currently owned by Reformation Heritage Books. WTS was developed during a six year period of research in the field of higher education. During the research, various academic and practical programs were evaluated. The result was the birth of Whitefield Theological Seminary in 1980. It offers graduate degrees in theological studies, as well as postgraduate degrees such as Ph.D and Th.D. The seminary is committed to the Westminster Confession of Faith and the Larger and Shorter Catechisms (1647). Graduates include Dr. RC Sproul, Dr. RC Sproul Jr., Dr. Greg Bahnsen, Dr. Nigel Lee, Dr. Kenneth Gentry and Dr. George Grant. Soon to be released is Whitefield Media. In less than thirty years RTS became one of the ten largest seminaries in the United States with an enrollment of approximately 1900 on three campuses, or approximately two per cent of the total enrollment in theological education in the United States and Canada. RTS has become the leading evangelical seminary in the southeastern United States. Westminster Theological Seminary prepares leaders for ministry, developing graduates with a depth of understanding of God’s Word and a heartfelt desire to use that knowledge in God’s service. A Westminster education starts with the Bible. Grounded in the Reformed tradition, Westminster teaches that the Christian religion is true, and that in-depth study of the Bible and its historical contexts will reveal this truth, building a bedrock foundation for Christian ministry. At Covenant, our purpose is to train servants of the triune God. We seek to help you sharpen your mind, develop the skills entrusted to you, and be changed by the transforming grace of God. Covenant Seminary is the place to dig deep into the Scriptures and to prepare for the overflow of ministry that results from a grateful heart. With the Apostle Paul, we “pray that you being rooted and established in love may … grasp how wide and long and high and deep is the love of Christ” (Ephesians 3:17-18). We invite you to study with us and to come to know the Covenant Seminary community as a place to nurture relationships that will prepare you, by God’s grace, to change the world. As a community of faculty, staff, and students, our goal is to see God’s servants trained for a lifetime of ministry. The goals of City Seminary of Sacramento are twofold; to provide a classical theological seminary education for ministerial candidates, and to offer continuing theological education for those already active in the ministry. Northwest Theological Seminary is the culmination of a concerted effort to bring a new Reformed theological seminary to the Pacific Northwest. The specific emphases is biblical theology in the tradition of Geerhardus Vos; presuppositional apologetics in the tradition of Cornelius Van Til; and orthodox confessionalism in the classic Calvinistic tradition. Greenville Presbyterian Theological Seminary is passionately committed to the authority of Scripture. Now in its 15th year, GPTS has maintained its identity as an Old School Presbyterian seminary. Recognizing that fewer men who graduate from the College or University are prepared for a classical seminary education, we have introduced our Propædeutic, or foundations, year. During this year, in addition to the Bible Survey courses, Introduction to Reformed Theology, and the beginning Greek and Hebrew courses, we teach Logic, Rhetoric, and the History of Philosophy. These courses enable men to profit more fully from the remainder of our curriculum. They also train our students to be more careful thinkers and articulate speakers. Knox has forged an unusually effective blend of strong academics and practical ministry to thoroughly prepare leaders of the 21st century. Our vision for ministry emphasizes the application of true, biblical Christianity to all aspects of our culture and our world. We equip you in a personal, mentoring environment to have a real impact in both the church and the world….except that they have jettisoned the Westminster Confession and are no longer truly Reformed. Mid-America’s mission is to prepare pastors as faithful servants of the Word and sacrament in the heritage of Reformed and Presbyterian Churches. Mid-America’s curriculum is calculated to assist in the intellectual and spiritual development of our students. We believe a thorough knowledge of, and submission to God’s Word, together with a solid grounding in its essential doctrines, is requisite to a God-glorifying and fruitful ministry. At Redeemer, you will find that we are a very supportive community, dedicated to your academic excellence and spiritual growth. Choose to experience a university environment rooted in a Christian perspective, and committed to helping you develop your unique gifts and discover all that God created you to be. With 70 different majors and minors to choose from, a dynamic campus life, and many opportunities to serve in the community, you will be equipped with the education and experience you need to positively impact our world. All education at Calvin Theological Seminary is grounded in Scripture and unified in a Reformed theological perspective.